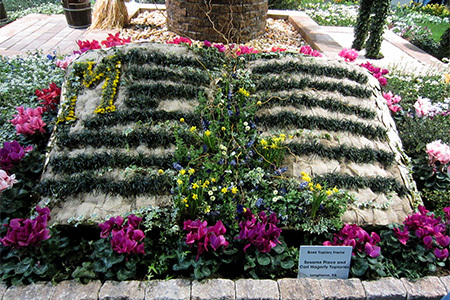 West Windsor, N.J. – The Philadelphia Flower Show, held annually at the Pennsylvania Convention Center, is the preeminent flower show in the country. 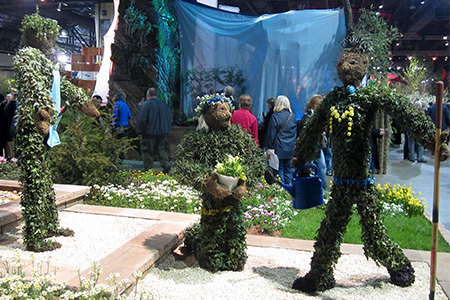 But as much as it’s about flowers and plants, it’s also about dedicated horticulturists who go above and beyond to produce premier displays with a significant ‘wow’ factor. 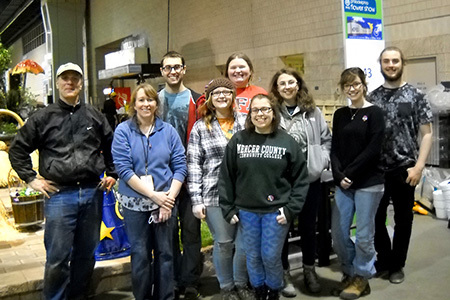 For the second consecutive year, Mercer County Community College’s (MCCC’s) Horticulture and Plant Science program participated in the show, held March 1-8, and delivered another crowd-pleasing display. 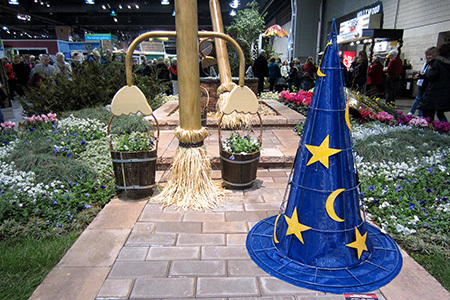 In keeping with the show's movie based theme, MCCC drew inspiration from the Disney film Fantasia, presenting “Horticulturist’s Apprentice Meets Sorcerer’s Apprentice.” The display earned MCCC a bronze award in the Education Category. According to Program Coordinator Amy Ricco, it was a thumbs-up experience all around. Following many months of planning, designing, selecting and gathering appropriate plant materials, and working long hours on topiaries and other elements, the students and faculty – volunteers all – spent four days prior to the show working in decidedly un-springlike weather transporting the exhibit to downtown Philly and installing it. The power was in the numbers. "We had a lot of student volunteers plus alumni and adjunct faculty members,” Ricco said, noting that 15 students helped load the truck and then reconvened at the Convention Center to build, man and tear down the exhibit. Even the college's facilities staff pitched in by building the brooms that were a central element of the exhibit. “The display came together really nicely. We were very proud of it,” Ricco said, adding that water feature was designed by faculty members who teach landscape design and construction. 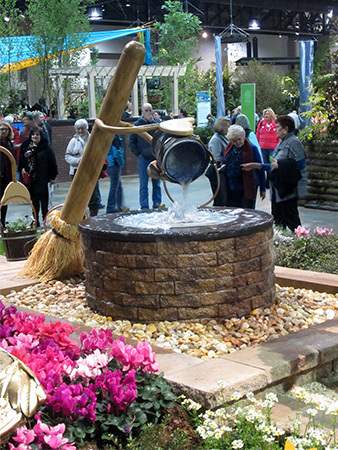 She reports that the water feature operated smoothly throughout the eight-day show and drew lots of praise from patrons. Ricco believes this year's display did a great job of appealing to all the senses. “While last year's insect topiaries were very popular, we had a better selection of plant materials this time around. And, the broom pouring the water, combined with the broom swinging the buckets, added an exciting element of continuous motion." She reports that the crowd reaction was uniformly terrific. “People loved it. They shared their enthusiasm and compliments and we even got some emails afterward. Children were particularly intrigued by the bucket and broom feature. In the court of public opinion, I think we earned a top prize,” Ricco said. Ricco singled out two adjunct faculty members for special praise: Dave DeFrange, from Copper Creek Landscape Management in Frenchtown, who provided tools, materials and labor, and Carrie Stanker, an instructor in landscape design, who toiled for many hours on the design of the display. Both instructors spent three days in Philadelphia building the exhibit. “It’s a labor of love for all of us. We are already thinking about our plan for next year,” Ricco said. Program Coordinator Amy Ricco, second from left, with MCCC's Flower Show volunteers, from left, Jerald Albrecht, Ed Franczak, Sophia Buckalew, Nicole Wright, Liz Csogi, Emmaline Armstrong, Casey Leone and Jason Cincotta. The display was inspired by Disney's Fantasia. The water feature was a big hit with visitors. Topiaries included a teacher and students. The MCCC book of learning.